Mulkerns was part of the texture of things, and this made her work harder to see, somehow. So it was with a peculiar sense of deja vu that I returned to the stories as an adult reader and recognised, for the first time, how good they are. Special Category, the first piece in this collection, echoes the life of her father, Jimmy Mulkerns, who was imprisoned in Knutsford jail and then Frongoch after fighting in the Four Courts during 1916. The main character, Bartholmew Mullens, suffers deprivation and torture in prison at the hands of an Irishman in British uniform. He also receives an unexpected visit from a girl who hails from Drumcondra but is in England on holiday. He asks her to bring along her elder sister, Harriet, if she ever visits again. In the next story we see Harriet – “Harry” – now rich, refusing money to her little sister, whose husband, Bartholomew, works at the gas company and is active in the union. If these two stories are semi-autobiographical, then this mixture of class tension and high aspiration explains some of the writerly urgency. During his time in prison, Bartholomew, a railway fireman, is more hungry for a pen and paper than he is for food, fantasising briefly about “a copying ink pencil that turned purple when you spat on it”. According to Frances, “Everyone of our age in Dublin writes poetry,” but it goes without saying that poetry does not pay the rent. During the 1950s Mulkerns worked on the Bell, founded by Sean O’Faolain, and her sensibility mirrors his, for seeming “cosmopolitan” – itself a slightly dated word – in a country then in love with the local, the rural and the past. Mulkerns’s work is set among the professional and bohemian classes. The style is outward looking, well read, with a confidence that feels like money but is more the absence of frugality and fear. This sense of social ease occasionally shifts into satire. In You Must Be Joking a successful author takes various lovers with the reluctant complicity of her pretentious husband, who eats olive oil on his toast and observes her book launch with a weather eye: the television people, the novelists in their tartan shirts, the huddle of poets (two of them “happy homosexuals”), the pregnant wives. Women are often pregnant, and families are large, but the characters are not pious. Their minds are questing and conflicted. People have affairs. An idea of glamour or fame constantly beckons or disturbs, as does the lure of the big house. One couple look “like jet set people in a TV commercial”. Another buy a wonderful old place, which they can’t quite fill or possess. The stories work between classes, but they also work between the countryside and Dublin, between family and infidelity, between old values and new. There are characters here of a kind seldom mentioned in Irish fiction. “Jewish girls live a more sheltered life than ours do,” says William in A Friend of Don Juan as he tries to protect the innocence of a young woman. In Summer in London we realise that the three female characters are all working to earn money for their abortions. It is remarkable how these stories, published between 1978 and 1988, consistently point to things we pretended, in those days, not to know. The priest who visits a schoolboy in hospital is called “Father Feeler”, and the boy’s father is not pleased by his attention. A husband leaves a party with another man. “I hope he is careful about his health,” the wife’s friend says. “That sort of life is very dangerous these times.” Sexual ambivalence is a sometimes sad fact of life. 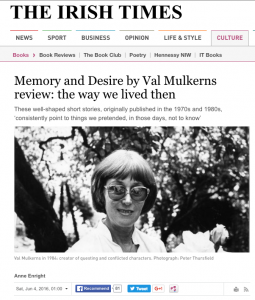 Memory and Desire, from which the collection takes its title, is the most anthologised story. Bernard – sardonic, restless, arrogant – is seduced and renewed by a television crew who spend a week making a documentary with him. He is especially taken by their director, who opens him to memories of his own dead brother. This story is clear and delicate, unafraid of its own intelligence, and of its sorrow. Liberalising, Shavian voices form a neglected strand of the Irish tradition, as evidenced by the fact that O’Faolain’s stories have been out of print since 1989. It is good to see Mulkerns back again: the business of reputation is hard work. These are not just well-shaped stories: there are details here to ambush the reader on every page. The Elverys elephant is seen from the top of a tram, so close that “an outstretched hand might touch the tassels of the headgear. The tram itself turns around with “electric flashes against a lemon sky”. A bottle of rosé is “the colour of onion skin”, a glance at a garden wall yields “a dead Virginia creeper” that “still held on with its bleached white arms”. When writing is this accurate, this good, it does not fade.